Does the Freeport Mayor Want The Fifth Third Bank Building for His New Home? Mayor Gitz said in his weekly column in the Journal Standard on July 13, 2014 that the MetLife Building is too big for city hall, and he does not want it off the tax rolls! Surprise! 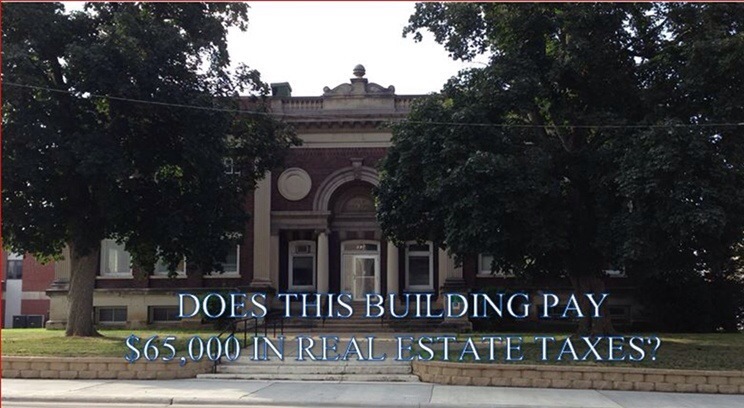 When did a Mayor of Freeport or the present city council get concerned about taking buildings off the tax rolls. Wake up Freeport! Every TIF in Freeport takes property off the tax rolls. The Fifth Third Bank building, if acquired by the city, will take a property off the tax rolls to the tune of $65,455.94. I guess $65,000 does not count! Just shift more taxes to the homeowner and the few remaining small businesses in Freeport. Oh by the way, before city acquires any more buildings, let’s deal with the existing buildings that it owns. It takes a lot of nerve to talk about buying more buildings when the city cannot even maintain its existing buildings. This entry was posted in City of Freeport and tagged city hall, frreeport, real estate taxes, tax burdon on homeowners, TIF's on July 14, 2014 by Good Day Illinois. Freeport City Council Meets Monday, June 16 – Watch Alderman Shawn Boldt in Action -A Real Leader – That Is a Leader for Higher Taxes! At the June 2 Freeport Council meeting there was the first reading of the new Comcast (cable) franchise agreement. As is usual with this Council, there was little constructive discussion except for Alderman Shawn Boldt who wondered if the 5% franchise fee (basically a tax of 5% on your cable bill) could be increased. He was advised that the FCC set the maximum which is 5%. It’s good to know that Alderman Boldt is looking for ways to increase our taxes. He must be auditioning for a job with Governor Quinn and his tax and spend friends in Springfield. The meeting will begin at 6:00 pm in the City Council Chambers at 524 West Stephenson Street, 3rd Floor. If you have Comcast Cable, go to channel 17 to watch live. Appointment of James Brown, Community Development Director, to the Board of Directors of the Jane Addams Trail Commission and the Pecatonica Prairie Path Commission, with Shaun Gallagher, City Engineer, as an alternate Board member for each Commission. This entry was posted in City of Freeport and tagged city hall, Freeport City Council, mayor gitz, taxes on June 16, 2014 by Good Day Illinois. At the Freeport City Council Meeting on August 5 the City Engineer, Shawn Gallagher, discussed the reports on Asbestos and Lead Testing for former City Hall Building (230 W. Stephenson Street) and former Carnegie Library Building (314 W. Stephenson Street) as provided by Fehr Graham. Unfortunately, the reports are not available online for the public to view. Mr. Gallagher gave an extremely poor summary of the reports. The reports were given to the Council for the members to review. This is a case of the blind leading the blind. Mr. Gallagher also mentioned the geotechnical testing on former City Hall Building (230 W. Stephenson) as provided by Testing Service Corporation. He sounded as if there were no serious issues. Again, the reports are not available online. 1. Full disclosure online of all reports on these buildings paid for by the City of Freeport which should be done immediately. 2. Firm estimates on the actual cost of restoring these buildings. 3. Disclosure of the sources of funding for the restoration of these buildings. Will it be real estate taxes or some other creative new tax? Remember this – Certain members of the City Council who have served many years have contributed to the present situation by doing nothing. They have failed to maintain the old library building, and let the City Hall building deteriorate. Can these same people be trusted to make a decision on the fate of these buildings? The answer should be obvious. This entry was posted in Uncategorized and tagged city hall, freeport, library on August 7, 2013 by Good Day Illinois.